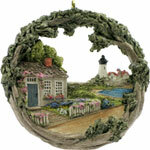 Handpainted ornament of classic Nantucket Island scene by Hestia Creations. Shows town docks in the foreground. Size 3.5" diameter.